When I bought my beautiful Cadillac, I felt that it would be discordant to have my black nylon “attaché” bag lying on the iced-coffee-colored leather upholstery in the back seat, so I bought the perfect beige leather bag from the Levenger catalogue (they bill themselves as selling “tools for readers,” but I always think of them as more “tools for writers”), which has been my daily companion ever since. (The look I was striving for was what I think of as "CEO": a gorgeous leather attache case, a pair of gray suede gloves, and a crisp Wall Street Journal carefully folded in thirds.) I used to get tons of compliments over that bag (which that catalogue no longer sells anything comparable to anymore), but now (110,000 miles later on the Cadillac, which is still more or less pristine, thanks to a rebuilt engine and transmission by my expert mechanic and a new gold vinyl roof and new upholstery on the driver’s seat), the bag has become pretty thrashed. It’s stained and loose and floppy instead of tight and some of the trim on the edges has worn off, but it’s certainly still serviceable, perhaps more than ever. I can’t say that I treat it as carefully as I did before (which in a terrible way makes me think of something written by Zora Neal Hurston about the black man Tea Cake beating his woman because she wasn’t as pretty as another one), and in a way I kind of have my eye open for finding a new one. But I’m not immune to marketing…in fact, I am extremely susceptible to it, especially when such experts as Chanel and top film directors and fragrance and color and packaging and language experts get together. Such as here: directed by Baz Luhrman. What’s to not like? Paris, Istanbul, ancient European train stations, the Orient Express, a sleeping compartment at night, ferry boats on the Bosphorus (if you had ever seen the movie Steam, you would be in love with Istanbul), two gorgeous people shown to great advantage surrounded by gold and skin tones, French accents, and (I’m guessing here) Billie Holiday. Might as well pierce us through the heart with a steam roller, but I love it. I think maybe because I am drawn to woolen navy blue coats (let’s say like a peacoat, although I do not actually have one, because I happen to live in an almost always warm climate), despite the fact that the model is not actually wearing a peacoat, or maybe it’s the French accent again, or a somehow magnetic shade of blue that is almost black, but only a glance at this advertisement made my think I should go back to wearing cologne again, and that this cologne ought to be the one. It’s all about image, of course…I had NO idea what this cologne smelled like, but, peculiarly, that didn’t even seem to matter (although to a rational person, that seems to be the only pertinent thing, and to the rational and practical person, no fragrance whether you liked it or not would be worth $59 a 1.7 ounce bottle…would it?). As it happens, my Visa bill was coming due and my Visa card is a Macy’s card, and you can pay your bill at the store. Also, I desperately needed a new pair of shoes, so I decided to go to Macy’s to pay my Visa bill and buy the shoes I needed. I was looking for something extremely comfortable that I could wear to work, so they had to be casual but look acceptably dressy. Regular dress shoes were feeling like a torture from the Spanish Inquisition. However, Macy’s had nothing that was close to what I wanted, so I figured I would try a regular shoe store elsewhere in the mall. 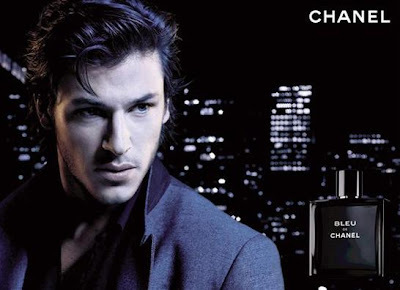 In walking through Macy’s to get to the rest of the mall, I happened to walk past the men’s cologne counters, and remembering the Chanel Bleu ad, I thought I would try a tester. I found the tester, sprayed a tiny amount of cologne on one wrist and rubbed both wrists together. To be honest, I did not like the scent at all. It seemed to be kind of similar to several other popular colognes, but lacked a certain “beauty” that I was hoping for. Well, I’m no expert on fragrance, but this one just didn’t seem to be “me”. Oh well, as I said, I wasn’t wearing cologne these days anyway and now I could save myself from spending $59.00. I found a shoe store, Clark’s, that had the perfect “comfortable, casual, but looks good enough for business wear” shoe and they were even on sale, so I ended up buying two pairs of the shoe I liked, one in black and the other in brown. I had been helped by both a female sales clerk and a male manager, so they both were at the counter ringing up my sale and they both began to gush over my attaché bag (that hadn’t received any complements in quite a while). They were saying things like “that’s a classic,” “gets only better with age,” “very handsome and appealing,” and I was quite pleased to come away both with some wonderful shoes that I could wear and with so much appreciation for my bag. Now that I had my shoes, I walked back through Macy’s so that I could pay my bill. Since Clark’s had been on an upper floor in the mall, I was now in an upper floor in Macy’s, a women’s clothing domain I had never entered before. I found a likely sales clerk who cheerfully handled my paying of the Visa bill. She also took the time to gush over my attaché bag, saying pretty much the same things that the clerks at Clark’s had said. Again, I was quite well-pleased by this, but also rather surprised. Later in my car driving home, I was marveling over this sudden approval over my poor worn out leather bag. At both places where I had a personal interaction, the sales people really loved it. Suddenly as my hands were turning the wheel of my car, I caught a whiff of the Chanel Bleu that was on my wrists, the fragrance now resting on its “final note,” which, by itself, was actually something that I really liked. Then I realized it, that’s what had to be it, it was the cologne that had been causing all this positive reaction to my bag. It must have seemed that I was (suddenly back to being) “fashionable”. That’s what I was thinking then. But then later, I read a review of the cologne by a fragrance expert, who defined the final note of the scent as “suede”…in other words, some kind of “leather”. So now I see that what must have been happening was the final suede note of the Chanel Bleu on my wrists was as if my attaché bag, itself, were sitting there broadcasting its presence and its “leatherness”, very much like if I had obtained from a car manufacturer that “new car smell” (which is NOT the same thing as the kind you can get at the car wash), anyone sitting in my car very well might start gushing over how beautiful my car is, despite the fact that it now has a mileage that has gone beyond 100,000 miles! Fragrance really is a powerful force. So I guess I am kind of back to keeping one eye open for a new bag, although I haven’t yet seen anything that is anywhere near as nice as the bag I already have. Such as these in the pictures that follow, I don’t like them very well because they have the messy complication of all those buckles and straps. Mine closes perfectly with just one elegant metal oblong device that fits through a slot in the flap and turns from horizontal to vertical to lock it closed. One flip of the fingers does it. I DO love the marketing idea of these bag ads, though, where they show their bags in use at exotic places around the world. I just happened to think that these camels in these photos are so damned cute, the way they curl up their legs when they are resting. 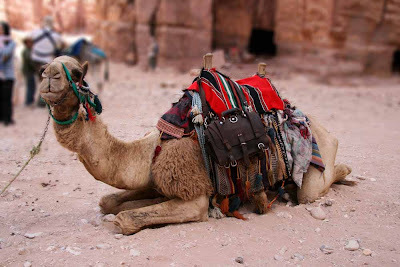 Why aren’t camels appreciated more? I mean, for sure these are as cute as kittens all curled up on a pillow, aren’t they? Yet think how hard they work. They deserve their rest, sweet things. 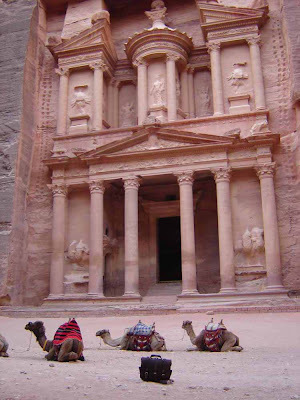 I wish I could pet them; does anybody ever pet the working camels? Yes yes yes about fragrance and quality leather improving with age. The 'base note' is what expensive fragrance has that cheap ones don't. The lasting of the fragrance is due to the ambergris content, and that's what really costs. I used to worry about camels until friends came back from Abu Dhabi and said that locals go out in the afternoons with feed for the camels, who all know when it's chow time and they cruise in. I see you have henry mancini in your music profile and I agree - I saw him in concert once, conducting a huge orchestra doing all his Grammy hits, and it was more exciting than rocknroll. and like Mr Randy Newman, I love LA. Marshall-Stacks--yes, that fragrance remained several days after from the one original spritz in the store and it definitely got better with age. In one of the Peter Mayle Provence books, he wrote about having a tour of a major perfumerie which is located in Provence (all the better to be near the lavender, I think it was) and described the hushed, elegant lobby and the highly polished marble floor, the elegantly-dressed and well-scented receptionist, and the whole rarified atmosphere of the work rooms where expert "noses" combined various scents (somewhat the "scent" equivalent of a blended Scotch company in Scotland) and ever since I have held that as a mental image of how a corporation should feel (not the stressful frenzy that is more the norm). How many nowadays do not have headquarters or offices that reflect the feeling they want to put forth about their product? Instead of "sold", their customers come away confused. Speaking of music, along the same vein, the most wonderful "music on hold" I had ever heard upon calling a company (NOT simply putting on a radio station that more likely than not has drifted, or irritating the customers by playing classical music that is not good for two-minute bites, or something meant to appeal to a generation not actually apt to be telephoning them--let's say punk rock, or, like my cardiologist's office that if you can believe it actually plays Goth; nothing like listening to a funeral dirge while asking to get your heart medications refilled) was with Proctor & Gamble, which, while I had originally been calling them angry over some major shipment that they had screwed up, ended up making me love them. When I pointed out the amazing mood-changing music to the person who answered, he told me that it had been custom-composed for them! Now THAT's what companies should do if they had any sense at all. It's all about atmosphere. Glad to hear about the camels. I saw a documentary about prized racing camels in Dubai. The best part is the deep pools of water that the camels get to go into. I wonder what on Earth these desert animals must think about actually being able to submerge their entire bodies in cooling water? Some sort of incredible "camel paradise", I would think! I'm envious of your having seen Henry Mancini in concert. What an experience that must have been. I love his music so much and he puts me into so many wonderful places. P/B, It's amazing how we can become so attached to certain personal possessions. I suppose I do myself specially if I'm luck enough to obtain something that could be called a one-off or just simply an item that can no longer be obtained. Oh but more importantly P/B I've responded to your post comment regarding atheism. Thanks for your response. Now it is my turn to be pleased about the camels getting the water pool play. I have been out to Newhall CA and seen the Disney bison herd at Buena Vista. My first CA visit was 1976 and I went to Tiny Naylors (now demolished) and to Ben Franklins (which I hope is still there). I like Old LA and of course, Raymond Chandler's every word just resonates ... 'the hissing of summer lawns ... ' etc. 1. find out the composer. 2. they may have had it done because they get LOTS of unhappy callers with lost shipments, and the music was easier to do than to sort out the Shipping Dept. We're back! But I guess you're not using this blog anymore.